In episode 66 of the Gameroom Junkies podcast, Patrick continues our coverage of Dragon Con 2016 as he sits down with filmmaker and game developer Joe Granato. Joe talks about the origins of his film The New 8-Bit Heroes, which chronicles his project to develop a brand-new adventure game for the original Nintendo Entertainment System. As a bonus, Patrick also gets a chance to try his hand at the drag and drop development environment created by Joe’s team in support of the project. 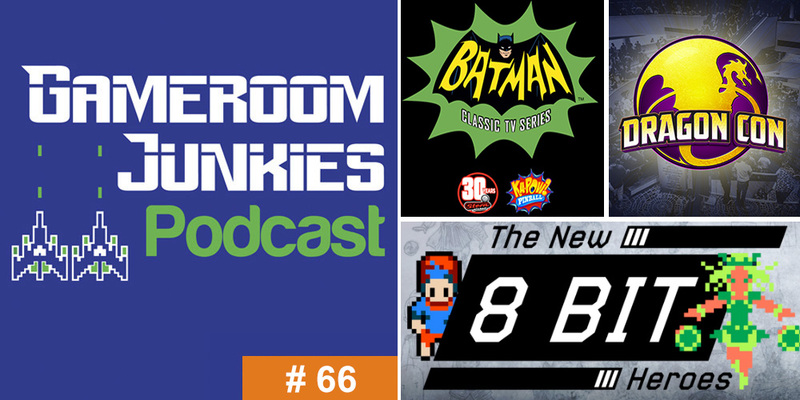 Additionally, in this episode we discuss the recently confirmed Batman ’66 pinball machine from Stern Pinball and our thoughts about the “privilege” of owning the Super LE version of the game. Don’t forget, you can listen to Gameroom Junkies by using the streaming player above, or you can subscribe to us on iTunes or Stitcher. If you like the show, please leave us a review. And remember, you can help support the show and save 10% on your next PinballBulbs.com LED purchase by using the code “gameroomjunkies” at checkout. You can find us on social media though Facebook and Twitter.